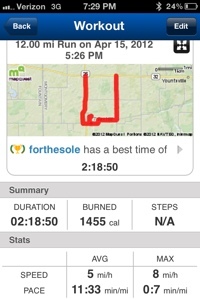 This weekend was my longest run during my training for the half marathon. Last week I did 11 and I slacked off and didn't run as much during the week as I would have liked. So this week I'm going to make sure to get all of my runs in to finish my training strong. My wife and I are heading up north to Chicago on Thursday and are spending the night and then going to stay with a college friend in Rockford on Friday. I'm actually going to get in my last 8 mile run in while we're in Chicago. I've always wanted to run on the amazing trail that runs along Lake Michigan and I'm stoked that I'm finally getting the opportunity to. I actually had a friend guest blog about it for me HERE a few months ago. Can't wait!